Ji Suk Jin showed off his friendship with BTS' Jin. 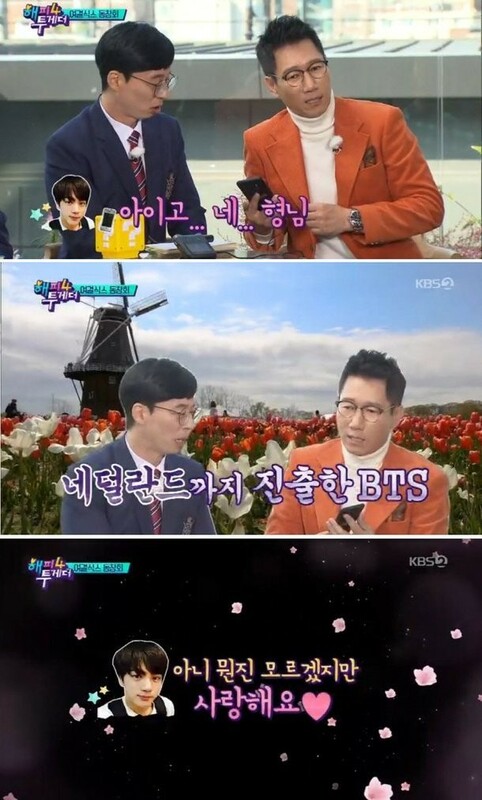 On the October 18 airing of KBS 2TV's 'Happy Together 4', Ji Suk Jin mentioned his bond with Jin, and said, "When I talk about Jin on my radio, fans tell Jin about it," and added, "There were days when I just played BTS' music all day." Ji Suk Jin also showed off the text messages he exchanged with Jin. After seeing the text conversation, Lee Hae Young commented, "You must be telling him to listen to your radio often. There's a text (from Jin) that says, 'Hyung-nim, I'm sorry. I don't think I can tune in." Ji Suk Jin then tried calling Jin. The idol star picked up the phone half asleep. He revealed that he's in the Netherlands, and said, "I don't know what this is but I love you." "I don't know what this is but I love you."